to my comptuer's time (which is the reference I used when I first set the time on the DM42), the time on the DM42 was off by several minutes. I don't remember if it was fast or slow now, as this happened about a month ago and I forgot to post a message. Is the clock time shown updated in software, or is there a HW clock? I could see a software clock loosing several minutes over a few months, but not a HW-based clock. In the time span of a year, the clock would probably off by an hour or more, which is very bad. IIRC, there were several complaints about the precision of this "Swiss" clock many months ago. They were answered that this is no quartz-controlled clock. So you experience what your grandparents did. That won't help but may make you feel better. Thanks. It doesn’t make me feel better, but at least it’s confirmation it’s not just my DM-42 experiencing this. It’s a shame they didn’t add a crystal. The additional cost would have been worth it. What about colour screen, GPS, wifi and stereo speakers? Well why not? I know you're being facetious but here goes: Color would need too many changes in the firmware to support. How many people would use GPS? Now Wi-Fi could be very useful! For stereo, again too many changes in the firmware. Since time functions are included in the DM42, a crystal would be very useful to make them accurate. Maybe there's a way to add one ourselves as there was in the HP-45. That calculator had undocumented timer and stopwatch functions but no crystal so the accuracy was terrible. Someone came up with a way to add a crystal and then the 45 became truly useful at timing events. The incremental cost of adding a crystal is negligible while the benefit is large. The cost/benefit ratio approaches zero. Since time functions are included in the DM42, a crystal would be very useful to make them accurate. Maybe there's a way to add one ourselves as there was in the HP-45. That calculator had undocumented timer and stopwatch functions but no crystal so the accuracy was terrible. Someone came up with a way to add a crystal and then the 45 became truly useful at timing events. The incremental cost of adding a crystal is negligible while the benefit is large. The cost/benefit ratio approaches zero. I concur. Does anybody know the pins where a quartz could be added to make precise timing possible? Is it possible to realize a software-based time correction on DM42? HP-41CX has a very good RTC. My 41CX loses only 0.2 sec a day with its default setting. Furthermore, it has functions to correct its time according to its actual accumulated time errors. As a result, the time error of my HP-41CX is less than 1.0 sec a year. My HP 48GX is a late model (made in 1993) and its RTC is not so good. It loses 1.6 – 2.0 sec a day. Unfortunately, the model has no clock correction function as HP-41CX has. I found a very useful application (HP CLK) and I installed to my 48GX and run the application on background. So, now my HP 48GX does not lose or gain more than 1.0 sec for more than 6 months. As far as I can see on my DM42 there is already a 32.768KHz quartz (or oscillator) loaded (Q1). 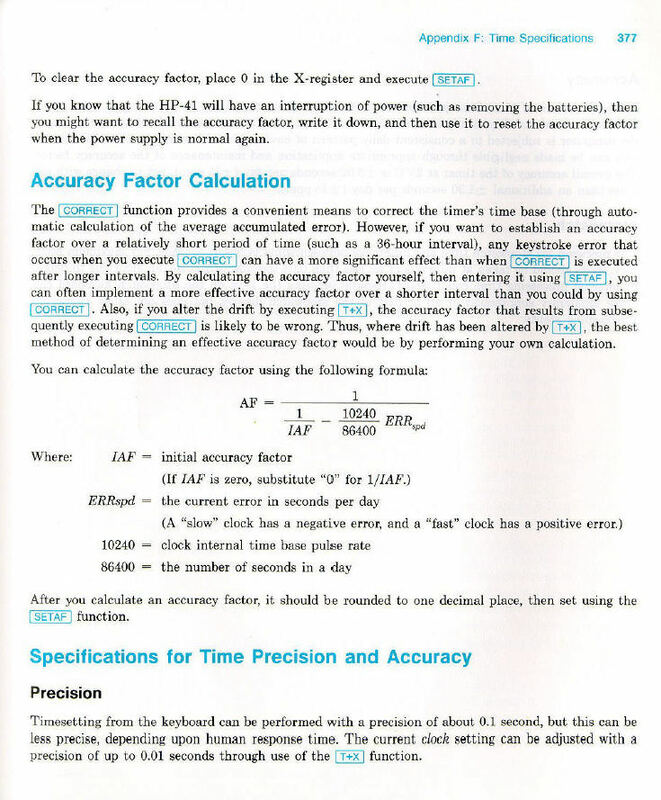 So I think that improving the accuracy may be done in software using some of the techniques described in this application note. than what we have now.